René Derouin, born in Montreal, Canada in 1936, is a multidisciplinary artist and activist for north-south artistic exchange within the Americas. His prints and sculpture bear the imprint of a life-long interest in pre-Columbian culture and Mexican mural art. 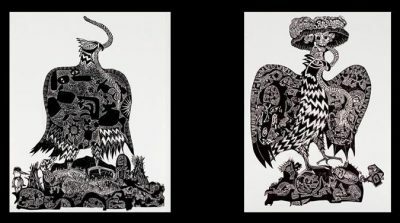 Derouin invites Mexican artists to the Fondation Derouin in Val-David, Quebec every year; in turn he was awarded the Order of the Aztec Eagle in 2006 by the Mexican government, and contributed a grand graphic diptych to the 2010 print project ‘Estampas, Independencia y Revolución’ commemorating the bicentenary of Mexican independence and the centenary of the Mexican revolution.